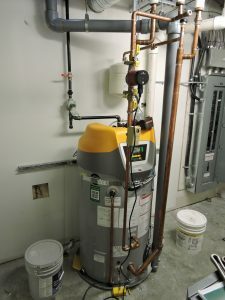 This installation uses a high efficiency condensing water heater. Don’t guess or make assumptions – don’t even start work without defining customer needs and expectations. Get some assistance – there are helpful experts out there who can help you put things all together. Many users have less tolerance for a DHW failure than a heating system failure. A few examples of critical applications include health care, restaurants, hotels, laundries, fitness facilities, etc. Reliability is the prime factor for these applications, followed by operating costs and first installed cost. It is important to involve user groups in the initial design and selection process. Even in retrofit situations, you should check with users to determine whether they were happy with the old system – they may well be willing to go for an upgrade. You will want to examine usage patterns to determine critical requirements such as – volume versus time, temperature, recirculation, space available, tolerance for failure, constant or intermittent loading and, of course, budget. Many design-build and service contractors are comfortable juggling the numerous design details required for their more popular system designs, but one size does not fit all. Once a system wanders out of your comfort zone – save yourself some stress and get in touch with an expert. There are too many liability issues associated with DHW systems to take any chances. 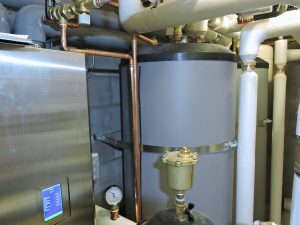 Condensing boilers and indirect tanks provide DHW in this nursing home. DHW equipment manufacturers typically have in-house engineering staff to help you work through the details. Bear in mind, however, that their prime goal is to sell you the stuff they make. That’s not necessarily a bad thing, but it is likely well worth the effort to consult with mechanical engineers who have taken a deep dive into DHW systems and are familiar with local codes. Size matters, and large DHW systems for commercial and industrial applications will require professional design. Overall, the DHW equipment popular today has been with us for over 50 years and has seen varying degrees of improvement in efficiency and reliability, but – there are a few new kids on the block. For many good reasons, the workhorse DHW heater in use for medium sized commercial applications continues to be the direct fired, fire-tube type gas or oil-fired storage tank-type. They are relatively inexpensive, simple and very reliable, and provide a volume of stand-by storage for instant response to small draws of hot water, while providing ample supply for large but short duration intermittent “dump” loads. Commercial heaters have much higher energy inputs than their residential counterparts, allowing faster recovery when depleted and supplying continuous draws at lower volumes. Combining them together into multiple banks – typically up to four units – provides redundancy and increased capacity. The reliability provided by multiple units has proven to be a good choice for critical service applications (like nursing homes, smaller hotels and motels), but hard-working tank heaters tend to wear out quickly, often in less than ten years. An important point to keep in mind with all commercial DHW systems is to have the owner budget and plan for a regular replacement schedule. Ample space in mechanical rooms, and easy in and out access, will allow for rapid and stress-free replacement when the time comes. There have been incremental energy saving enhancements added to these tanks in the last two decades, such as vent dampers or power venting, electronic ignition and better burner technology, and some increases in efficiency have been outstanding – you get what you pay for in this category. Tankless DHW heaters keep this restaurant in hot water. An energy saving alternative for direct-fired storage tanks marries commercial condensing boilers to high capacity indirect storage water heaters in a dedicated DHW package. Initial installed cost is higher but expected equipment life is more than doubled in hard use applications, and energy savings can be outstanding. A modular approach is recommended to reduce the likelihood of interruption in hot water supply due to equipment failure or service down-time. Heating boilers can do double duty for making DHW by diverting some modules through a heat exchanger or indirect tank when needed. 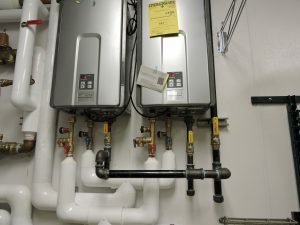 Another “old timer” in the DHW toolbox, resistance element electric water heaters of various sizes and capacities, are still popular in many commercial applications. Their simplicity, low first cost, and almost maintenance free reliability makes them an excellent choice when loads are light, intermittent, and scattered throughout a facility (or where electricity rates are low – ed). I have seen a gradual increase in small point-of-use instantaneous and storage heaters. The use of low flow fixtures, the desire to eliminate re-circulation piping and the move to reduce carbon emissions has given them a strong tailwind of late. The new kid on the block is the “on-demand” water heater. They have been available for many years, but lately the “on-demand” category options have exploded due to the development of smaller inexpensive modulating units produced in large volumes by Asian factories. The newer “tankless” units start as low as 90 thousand Btu/h. When the Asian manufacturers partnered with North American manufacturers and sales networks, commercial utilization developed rapidly. Larger units (up to 200,000 Btu/h) can easily be combined in multiple arrays to provide hot water for bigger buildings and high demand applications. Manufacturers have developed pre-engineered packages that include mounting racks, venting and piping kits, and most important – controls. These are not do-it-yourself, mix and match systems – you need to buy the whole package. I really urge you to look at these newbies seriously – I have seen them installed in restaurants, hotels, schools, and commercial office buildings, and have heard of them installed in just about any commercial application you can imagine – so far so good it seems. Will these multiple small heater arrays eliminate the larger, copper water-tube on-demand units we have seen in larger hotels and multi residential high rises (up to two million Btu/h and beyond)? Time will tell, but in emergency retrofit situations it might be an uphill battle. Unless facility managers pre-plan for such retrofits, the time it takes to re-engineer and completely re-pipe a mechanical room for these units may reduce the uptake – it is much quicker just to replace like with like. And many manufacturers of new large commercial units specifically design them to be backward compatible with their earlier models to take advantage of poor retrofit planning and sudden emergency replacements – smart. On the other hand, because the new kids are modular and are generally wall or rack-mounted, a planned replacement may actually mean reduced down-time if the contractor can pre-install the new equipment while the old beast huffs and puffs along. We will continue our look at commercial DHW in the next issue.